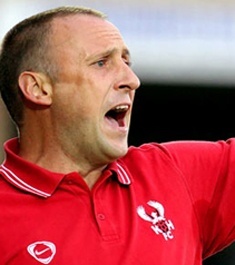 The Harriers former midfielder and manager, Mark Yates, returned to the club for a fifth time today to take over the managerial reigns from caretaker manager Colin Gordon following a run of poor results since the sacking of Neil MacFarlane at the beginning of the month. The move has come on top of an unsettled fan base who, following Saturdays home defeat to struggling Alfreton Town, have been calling for a permanent appointment sooner than later otherwise we’d be facing a mid table finish to the season. In his two stints as a player with us he became a dependable club captain who took no prisoners and that rubbed off onto his managerial career with us from 2006 until 2009 when he left us to manage Cheltenham Town. He was the same with them and at Crawley Town too until he lost the job there in April 2016. He returned to Aggborough for a while in charge of our U23 side but left that to become the Solihull Moors manager in November 2017 when he saved them from almost certain relegation and built a foundation at the club that has seen them riding high in the National Premier this season. He left the Moors to take over at Macclesfield Town and it was there that he first met a setback that saw him last only four months before getting the sack. Now back with the Harriers for the remainder of the season we’ll be hoping that he can get us back into the play-off push. Knowing how Yates likes his teams to play it’ll not be what Colin Gordon has supposedly instilled into the club but will be a more direct route to goal with a tougher defence added too.